Walt Kowalski is a widower, grumpy, tough-minded, borderline-hateful, unhappy old man who can't get along with either his kids or his neighbors, a Korean War veteran whose prize possession is a 1973 Gran Torino he keeps in cherry condition. 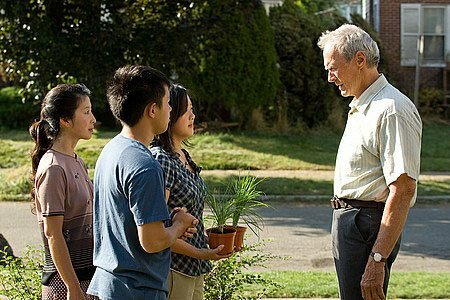 When his neighbor Tao, a young Hmong teenager, tries to steal his Gran Torino, Kowalski sets out to reform the youth. Drawn against his will into the life of Tao's family, Kowalski is soon taking steps to protect them form the gangs that foul their neighborhood. Download Gran Torino in Digital HD from the iTunes store. 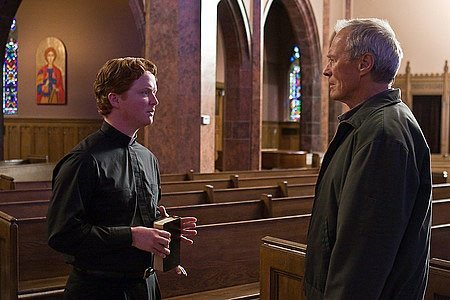 Gran Torino images are © Warner Bros.. All Rights Reserved. Eastwood, at 78, is a living-film legend. He personifies power, manliness, determination, and grit. He is a rare breed of star who proves as comfortable behind a camera as in front of it; and if the passage of time makes it likely that we really are seeing the last of his acting career, coming off Gran Torino, I think I can say we will be poorer for its passing. 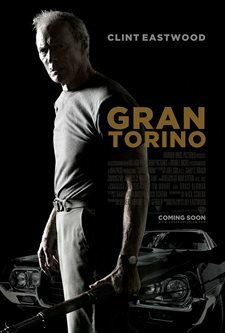 In Gran Tornio, Eastwood plays Korean war veteran, Walt Kowalski, who worked for years at a Ford plant; and he has one of the 1972 classic muscle cars to show for it. He served in the infantry in the Korean war, of which he still has a M1 Garand rifle, and has retired to a suburb of Detroit. His wife has recently died, and he lives alone with an anger that was built over years of disappointments and resistance to change. Change is coming though; around him, his suburb has become less and less ethnically white. He lives next to a Hmong family (from the mountain regions of Asia, such as Vietnam). He doesn't like them, but then, he doesn't like much of anyone -- first and foremost his family who have snotty grandkids and adult sons who find the old man irascible and would rather phase him out of their lives. When gang activity spills over into Eastwood's front lawn, and someone tries to steal his beloved mint-condition car, he gets involved in the neighborhood troubles and the family next door. He also tells some kids to get off his lawn. Yeah -- Eastwood is old! Walk Kowalski is probably supposed to be the same age as the actor who plays him, and while he does tell a kid to "get off my lawn", he also tells a group of black gang bangers, "Ever notice how you come across somebody once in a while you shouldn't have messed with? That's me". He means it: he's chilling! 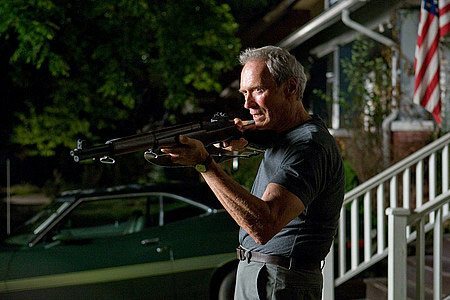 There is something Eastwood knows about projecting strength and force of will that comes through in Gran Torino in a way that is truly, utterly believable. He is the guy you don't want to mess with. The story is about his redemption from his anger -- which comes out as racism, but he is not full of hate. I will touch on this more later. It is about his reluctant evolution into a role model for some of the local kids. It is about a confrontation of modern changes, old-fashioned ideas, and what it means to be a man. This is a role that Eastwood fills the shoes of ironically, and to say there is no one else you can imagine doing it is not an understatement. I was reluctant to see a movie that cast Eastwood --one of my favorite actors and directors -- as a racist. I believe that the key quality of racism is hate -- not, specifically, anger; and I draw a distinction that is important to me, but is not worth going into here. While Eastwood is an angry guy, unable to cope with change around him, and he uses language like "Gook", referencing to the face of the Hmong neighbors -- the racist term for the people he killed in war. Despite that, however, he is not at all a black-hearted character. It is not a defense of the language that he is equally offensive to his friends (white guys of various ethnicities to which he refers to by their racist names), nor does the movie at all apologize for how he talks. 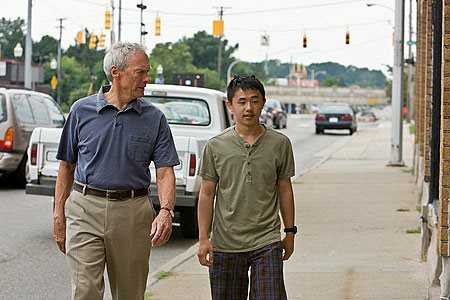 What Gran Torino does, however, is earn the use of the language by showing it in the context of a believable character who is far, far deeper than a sound-bite or a catch-phrase. Kowalski is far more than the way he talks, and the movie does not rely on a weak, predictable arc of first vilifying, then enlightening, and finally redeeming him. Instead the movie shows Eastwood's revelation not explicitly about race, but rather about family and what constitutes one. He does not become sensitive to racial issues; he still calls people (everyone) by insulting, if not always racist, names when it suits him; but instead he makes some well-wrought decisions about what is meaningful in his life and whom he plans to be there for. Before closing I want to talk about another context for the movie. it has come out featuring by name a classic, American car manufactured by Ford, in a year when we might, possibly, see the death of American cars altogether. Although it looks less likely now than it did a month ago. In a way the principals in the movie, Eastwood, the Gran Torino, and Ford itself are all dinosaurs or almost dinosaurs. (A point of comment -- Eastwood's son is a Japanese car salesman.) Like the actual dinosaurs, we can look at them on the screen and feel their power. It may not be possible to make a new car that can fill the niche of the 1970's muscle cars, but would a knock-off, whatever the engine, feel like a feeble attempt to recapture an old, faded glory? I'm not sure. I do know that these cars are part not just of the American fabric of life (which changes with each decade and gets more and more recessed), but of the movies which, we can hope, do not change -- or at least do not change too much. These cars are actors in a way in their own right. There may come a day when we cannot get them anymore, even for the screen, or when we might find some in a museum; but they are, for whatever reason, no longer relevant. Watching Gran Tornio and watching the power Eastwood brings to the role, I wondered if it would have worked without the car? With another car? With a modern car? Even a nice one? Gran Torino images © Warner Bros.. All Rights Reserved.